Most Magic players identify with a certain strategy. Some people like goldfishing complicated combos. Others enjoy dropping three Lava Spikes on an opponent under ten life. I prefer attacking with efficient creatures while deploying disruption, and manipulating my library to find what I need. Decks that give me this experience are generally blue, green, and red. If you’d told me a month ago I would be playing a monoblack Eldrazi deck in the coming format, I would have laughed in your face. Turns out I’m still laughing in your face. But only because your Tarmogoyf is so small. I usually put “lands” at the end of my brew articles. Today, I’ll lead with this section to explain how absurd the Eldrazi lands are. Eye of Ugin, Eldrazi Temple, and Urborg, Tomb of Yawgmoth allow Bx Eldrazi decks to play Modern one or two turns ahead of everyone else by breaking Magic’s fundamental rule of one land per turn. We’ll examine the applications of Sol lands in Bx Eldrazi by comparing them to those of Sol lands in Legacy. In the interest of simplicity, let’s consult Drew Levin’s previously stock Dragon Stompy list from 2011 for reference (recent versions tend to favor a Moggcatcher package). While most players need to spend two cards (two lands, or a land and a Birds of Paradise) achieving two mana, Sol lands produce two mana with one card. Since they remain on the battlefield to act as two lands for the rest of the game, they break even on the card disadvantage of Chrome Mox or Gathan Raiders in Dragon Stompy. Modern houses many decks preoccupied with accruing incremental advantage over longer games (Jund, Abzan, Twin, Grixis, etc.). Getting up on cards by simply making land drops positions Eldrazi decks well against these established interactive decks. The most obvious draw to Sol lands is the speed they promise. Few fair Legacy decks can tangle with turn two Arc-Slogger. In Eldrazi Stompy, turn two inspires a similar brand of terror across the table. So does turn three Conduit of Ruin into turn four Ulamog, the Ceaseless Hunger, and all we need to make that dream a reality is a hand full of Sol lands and a single Conduit. I’ve even pulled it off after casting Dismember and Chalice of the Void. Splinter Twin is the only other Modern deck capable of threatening a turn four kill after interacting every other turn of the game, and this claim to fame has kept Twin on top of the format since the very first Modern Pro Tour. Except the pieces of the turn four Ulamog “combo” each pull more weight on their own than the comparatively silly Deceiver Exarch, and Eldrazi decks play a better fair game than Twin – or anything. Some players I know have compared Bx Eldrazi decks to Tron, another strategy that accelerates into huge plays with colorless lands. In reality, Tron is a worse Eldrazi deck. When Ghost Quarter hits a Tron land, the deck has to find that specific land all over again before it can make a reasonable amount of mana. Additional Quarters (or Paths) significantly hinder Tron, as the deck plays a single basic Forest. Conversely, we’ll happily – err, resignedly search up basic Swamps to replace our destroyed Eldrazi Temples, or just play another legendary Eye of Ugin or Urborg, Tomb of Yawgmoth after one bites the dust. Unlike Urza’s Tower, the rest of our Sol lands don’t suddenly become when we lose one. We don’t need to spend time and mana digging for “other” Sol lands, instead casting our spells off the ones we have. I’d sooner compare Bx Eldrazi decks to Affinity. In Modern, only Affinity has access to acceleration this consistent; until now, nobody else attacks with nine permanent power on turn three. Infect and Atarka Zoo can blitz pretty hard, but at the cost of their cards. By contrast, Affinity repeats the attack, or improves it, every turn after. The deck’s speed and power are well-known among Modern players, and impactful hosers like Creeping Corrosion, Hurkyl’s Recall, and Stony Silence keep the Robots in check. The only hoser I’ve found to damage the Eldrazi decks is Blood Moon, which exists in a single color and forces deckbuilders to craft conservative manabases if they want to play it at all. In other words, Eldrazi Stompy is shaping up to be harder to stop than Robots. Perhaps ironically, but not unfittingly, Affinity is our worst matchup. Unfortunately, we can’t play 24 Sol lands. I’ve picked three colorless lands to compliment my swamps. Ghost Quarter: A bomb in the mirror and against manlands. Keeps us far ahead of other big mana decks like Amulet Bloom or Tron. Can also catch unwary opponents off-guard as they tap out for Blood Moon, sniping a singleton basic Swamp in response. Gemstone Caverns: Allows us to take the initiative on the draw, enabling turn one Chalice of the Void and turn two Seer or Smasher. Accelerates into Drown in Sorrow, Sun Droplet, or Liliana of the Veil against aggro decks, and into Cranial Extraction against combo. Serum Powder increases the likelihood of opening Caverns on the draw. Keep in mind it’s sometimes correct not to get the luck counter, so we can cast colorless-specific Eldrazi. Since it’s a legend that doesn’t attract enemy land destruction, we shouldn’t run more than three Caverns to avoid flooding on them. Wastes: A colorless source we can search off Ghost Quarter or Path to Exile, we don’t seem to lose anything from playing over the fifth Swamp. I’ve omitted Relic of Progenitus, and with it, Wasteland Strangler and Blight Herder; I don’t love threats that require another card to function optimally. also requires another card to shine – a card, in fact, per turn. Reshaper almost always comes down on turn two, and with Gemstone Caverns, sometimes on turn one. He mostly wants to tangle with enemy attackers, netting us a card in the process (hopefully a mana source, but we’ll settle for Liliana of the Veil). Notably, trades with every one-mana creature in Modern, as well as every two-drop besides Tarmogoyf. On his own, Reshaper attacks like a Wild Nacatl. (With Eye of Ugin on the battlefield, he even costs the same as Wild Nacatl.) Reshaper pressures decks that clock us without attacking, like Scapeshift, Twin, and Ad Nauseam. He’s a nightmare for grind-em-out midrange decks like Jund and Grixis, since their Bolts essentially put them down a card against us. If he “cascades” into another Reshaper, they’re down multiple cards! When Bx Eldrazi Processors reared its head in Modern, pilots and opponents agreed Oblivion Sower was the best creature in the deck. As of Oath of the Gatewatch, will surely usurp that title. Jund players have been chasing Thoughtseize with Tarmogoyf since Modern was born, and rolls both cards into one. He frequently comes down on turn two, and exiling the card helps keep early-game Tarmogoyfs at 3/4. Turn two 4/4s are rarely permitted in Modern, with Tarmogoyf being the one exception to this rule. That Seer seizes the opponent’s answer brings him from playable to degenerate. His effect disrupts linear combo decks without one-drops like Inquisition of Kozilek, allowing us to run Chalice of the Void and rely less on finding black lands early. After the three-mana and the four-mana , plugs the five-mana “curve hole” left by Blight Herder, giving us something highly impactful to do on the third or fourth turn. I evaluate creatures based on ones I know intimately. To me, Smasher plays like some unholy mashup of Hooting Mandrills, Stormbreath Dragon, and Battlegrowth. Given his bulk, speed, and evasion, ‘s ability is plain gratuitous. Creatures this fast and large need organic checks so interactive decks can keep them under control – for Smasher to play fair, Terminate, Path to Exile, and even Vapor Snag should answer him without forcing casters to Raven’s Crime themselves. Smasher runs interactive decks out of either cards or life points very efficiently, and one often foreshadows the other. Sower’s ability discourages opponents from responding with Remand, and he does ramp us most of the time, Relic or no. Eye and Urborg eventually turn those humble Windswept Heaths into Ulamogs. But the real reason to play Sower is his size – 5/8 doesn’t die to anything! 4/5 Goyf and a Lightning Bolt? Nope. Roast into Pyroclasm? Try again. Gurmag Angler plus Kolaghan’s Command? LOL! Conduit comes with a Sol land attached and searches the deck for big boss Ulamog. An Eldrazi Temple in hand guarantees we can cast Ulamog, the Ceaseless Hunger the turn after Conduit resolves. Otherwise, we’ll merely wait a few turns, during which time opponents have a 5/5 to kill. Ulamog’s effect triggers on cast, meaning not even Counterflux prevents him from casting double Vindicate. Once he resolves, Ulamog defeats opponents with infinite life or pages of chump blockers with his second ability. One Ulamog suffices in most Eldrazi decks, but I play two so I can Serum Powder away hands with Ulamog and not miss him later. The ‘Drazi can’t rule the world on their own. Many players consider mainboard Relic of Progenitus one of the reason to play Bx Eldrazi in Modern. Once Oath becomes legal, I don’t think this argument holds much ground. Heartless Eldrazi decks have already traded the grave-hate package for speed, and the Eldrazis we get in Oath boast such immense power that we don’t need to rely on two-card combinations like Relic plus Blight Herder to fill out our threat suites. attacks through Lingering Souls tokens, and Oblivion Sower dwarfs Tarmogoyf anyway. Our BGx matchup is so favorable I don’t miss Relic here. Blanking Path to Exile, Lightning Bolt, and cantrips with Chalice of the Void seems more valuable to me against interactive and linear decks alike. Two of my favorite hate cards, Blood Moon and Choke, have seen Modern play since the format was announced. 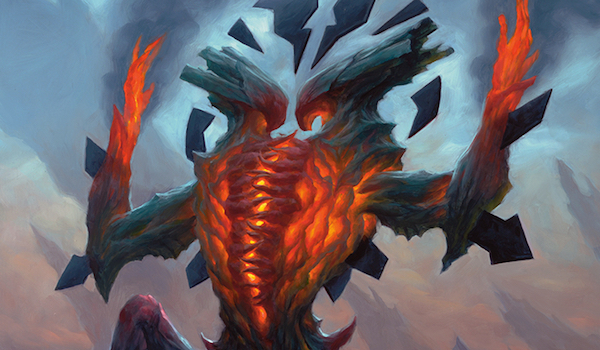 A third, Chalice of the Void, never lived up to the precedent it sets for hate cards in Legacy – where it helms the Stompy archetype – or Vintage, where it was recently restricted. I’ve tried for years to squeeze Chalice into my Modern decks, but to no avail. Most recently, I flirted with a GRx Moon build revolving around Goblin Rabblemaster before abandoning the Chalices completely and running Lightning Bolt myself. The things we sacrifice to fit them make up the opportunity cost of running lock pieces. Chalice didn’t work in that deck because the opportunity cost of running it – playing format-defining, on-color one-drops like Lightning Bolt – proved too steep to justify its inclusion. In Eldrazi Stompy, this opportunity cost is virtually nonexistent. Modern Eldrazi decks do play a few one-drops, among themInquisition of Kozilek,Relic of Progenitus, and Expedition Map. covers the ground we lose by excluding discard spells, and provides a respectable body to boot. We’ve already explored Relic, above. And Serum Powder helps the deck find Sol lands, eliminating the need for Expedition Map – more on that card below. Strategically speaking, Chalice of the Void “solves” this deck’s worst matchups. Bx Eldrazi loses to low-to-the-ground aggro strategies, or decks that ignore fat bodies and go off regardless. These decks include Burn, Infect, Bogles, Storm, and UR Delver (yes, with !). Incidentally, all of them struggle to win through Chalice. Currently, Serum Powder only sees play in two Vintage decks. Espresso Stax, the format’s reigning Stompy deck, uses the innocuous Darksteel artifact to aggressively mulligan into Mishra’s Workshop; Dredge, to find Bazaar of Baghdad. We use it to assemble an opener with enough Sol lands to power out Eldrazis ahead of schedule. “Workshop decks, when they are at their best, are incredibly redundant things. Because of the limitations of Workshop, they have to be. They can’t control their draws like a blue deck. Serum Powder would allow the Workshop pilot to see more hands, increasing the chance that they opened with sufficient mana and threats. And what did it really matter if they removed some of their mana, or some of their threats? There were more. I played one game in particular against Nick [Detwiler] where he opened on a hand of seven and then used three Serum Powders, removing 21 cards from the game. As I looked through, I saw that he had removed three of his Smokestacks. I joked with him “Oh man, this is great, you won’t be able to beat me this game.” Nick opened with a Workshop, then a Chalice of the Void at 0 and another Chalice at 1. He dropped a Lodestone Golem and a Sphere of Resistance on turn two. He dropped another Lodestone Golem and another Sphere effect on turn three. Like Nick, I Serum Powder ruthlessly, binning land-light hands with extreme prejudice. I won’t hesitate to exile all my Thought-Knots or even boarded-in hate if it means digging for hands that curve out better. At its most consistent, Eldrazi Stompy is a turn-four deck. Powder helps maximize that consistency. That said, I don’t exile every hand containing Serum Powder. My favorite way to analyze a hand with Powder is to picture it without Powder. If the rest is keepable, I settle. There are plenty of superb four-card hands in this deck (i.e. Temple, Eye, Thought-Knot, Urborg), so even hands with multiple copies of Serum Powder can be keepable. The primary benefit of digging for Sol lands while we resolve mulligans, and not once the actual game has begun, is that we become faster. The Eldrazi decks I’ve paired with online spend the first two turns setting up their mana with Expedition Map or Ancient Stirrings. Not only does Chalice of the Void block these plays, if we instead spend those turns casting and , we gain an edge in the race. Powder helps hit relevant cards, too. This upside mainly comes in handy during boarded games, when landing a turn three Drown in Sorrow or an on-curve Cranial Extraction can save us from certain doom. I can also name plenty of matchups where I love having multiple shots at turn one Chalice of the Void. To the naysayers, I’ll ask a question: Why don’t you want to play Serum Powder? We’ve discussed Chalice’s opportunity cost, and Powder carries a similar drawback. After all, who likes drawing three-mana, colorless-producing artifacts in the mid-game? Um, we do! When it’s not setting up unbeatable openers, Powder helps reach ten mana for Ulamog and essentially taps for a color in this deck. It even lets us cast colorless-specific Eldrazi under Blood Moon. As with Chalice, we can run Powder at virtually no cost to our deckbuilding choices. The more I play with Serum Powder, the more I’m impressed by the consistency it brings to Bx Eldrazi. Dismember doesn’t charge life with an Urborg out, interacts at instant speed for a single mana of any (or no) color, dodges Chalice of the Void, and kills nearly everything in the format. Paying life ostensibly hurts against aggro decks, but Dismember‘s potency there more than justifies its inclusion for these matchups. The biggest strike against Dismember in Modern is a given strategy’s weakness to a specific kind of aggro deck: the one with Lava Spikes. Fortunately, Chalice of the Void and our fat Eldrazi ground squad make Burn the easiest of our aggro matchups. Liliana hassles any aggro deck that doesn’t immediately put three bodies onto the battlefield, and gives control and midrange decks a headache. She’s easy to cast with Urborg in play, and otherwise not too challenging between our Swamps and Gemstone Caverns. The only thing I dislike about Liliana is her anti-synergy with Chalice of the Void; once we resolve the Chalice, opponents have a whole grip of cards to throw away. Our Eldrazi overlords are here to stay, though we don’t know what an optimized build will end up looking like. I imagine a few viable versions will crop up, including an aggro variant, a control variant, and something in-between. Peoples’ favorite colors may influence the direction future builds take. For now, I’ll continue playing with this version, which has shown great promise in its first week. I don’t have enough space in this article to cover matchups (in a nutshell: everything is favorable except Affinity, Merfolk, and Grishoalbrand) or land sequencing (which I’d like to call a prerequisite to success with the deck, but realistically this deck wins a lot even with stumbles). I’ll address all that another week. In the meantime, consider buying some Blood Moons. Previous Post: Awesome Decklists from SCG Charlotte! Nice build. I put a deck like this together on MTGO after reading and started messing around and its a lot of fun. The main difference is the playset of Conduit of Ruin, Heartless Summoning, and I’ve gone up to a full set of Ulamogs for the sake of pure ridiculousness. I don’t do a lot of testing prior to new sets based on time and playgroup limitations. But I can say that the additional card draw from Matter Reshaper would be good, and perhaps running a 1-of Mirror Pool or Sea Gate Ruins would help with adding reach. Probably Sea Gate Ruins is better. It is interesting the level of auto-scoop when faced with Chalice of the Void for 1 in Modern. I’m always surprised the card doesn’t see more play. Regardless, I’m looking forward to OGW. Heartless makes your Thought-Knots die to Bolt, so I don’t think it’s worth playing. Like Map, it’s another “ramping tool” that slows us down. Powder lets us make real plays every turn of the game. I have to say that I’m fond of Chalice of the Void to begin with, but this may be one of the best matches for it available. This deck can T1 IoK into T2 Chalice, which many decks will find very difficult to deal with. I’m a bit iffy on Serum Powder, but frankly that’s a symptom of my not having used it much, and Gemstone Caverns on the draw feels like it would be a really solid way to seize the initiative (3 may not be the right number, but it should be in the deck). The lone Wastes confuses me a bit, and 24 lands is on the low side of what I’ve seen in ramp Eldrazi decks, but this is a very promising start. Conduits can be clunky. Moving forward, I’m cutting one for the 25th land: Sea-Gate Wreckage. Went over Wastes in the article. I see that, but I don’t see why it isn’t a Cavern of Souls, especially given that getting a Thought-Knot Seer caught by a Remand or something can be annoying. Nice deck. Any changes to the list after the recent banning? Also, how are u finding lotv? In my minimal testing she is feeling like a dead card most of the time due to a lack of black mana. The same could be said for any card requiring BB. I still like her. She’s a house in the mirror and against most aggro decks. I’m running a Crucible for extra points vs. big mana decks instead of the second Cranial Extraction now that Twin is gone. Nice deck, although I have one question. Gemstone Caverns taps for one of any color instead of with a luck counter, right? Meaning, you can’t actually cast Matter Reshaper turn one? Or am I misreading the card? But question; why no Inquisition of Kozilek? I understand it’s dead with Chalice on the battlefield but t1 IoK into t2 Chalice/Thought-Knot is backbreaking. Surely you must be willing to make the compromise. Not only that but discard tools are incredibly powerful with Liliana and CRAZY with Reality Smasher/Thought-Knot. Agree that IOK is sweet, but I’m not willing to make that compromise. We can keep seven-land hands and dominate opponents. Odds of that happening decrease dramatically with “dead” draws in the deck. Fair enough. Keep us posted of any updates! Thanks for a great article! List looks awesome. What are your results against linear stuff like Infect and Zoo? Also, what are your thoughts on including a few simian spirit guides to play t1 chalice? I’ve also shifted away from processors and i just built a similar deck (with iok no chalice, with map no lili and with mind stone no serum). So this got me thinking, do you think a mono colorless version could be good? You still keep urborgs (for eye) but go mono colorless lands with maybe 2-3 wastes and just value lands. You could swap lili for something else, like endless ones and warping wail. Why would you do that? What good is it? If you want to for the sake of budget or whatever, try it out and see how it goes. The idea of cutting black altogether does not seems to have few merits related to winning games though. There’s just no reason not to play a few black cards. Since we’re in Urborg anyway, we might as well run insane cards like Liliana of the Veil and Dismember. Has anyone done any testing with this? Deck seems really good. Been playing a variant. Endless One is a 3 of for me right now, because he does wonders for curving out hands more consistently. I cut 2 conduits and an Oblivion sower for them because you really don’t need to go any bigger than Reshaper into Thought Knot into Smasher. I also ended up cutting the second Ulamog for a Dread Defiler because you can cast him and activate his ability once on turn 4 with the right setup, and he provides a non-combat oriented way to deal damage. He’s also much less of a dead draw cf the Ulamog, who has often been a dead draw. Getting to 10 on turn 4 largely isn’t worthwhile. Congrats on essentially calling it and coming up with the best deck in Modern right now, long before the pros did. I knew you were on to something and I’m so glad I picked up a couple Chalices a week ago after reading your article. Thanks for the great content and keep it up!